*To enjoy Dolby Vision content, the video streaming app/service must support Dolby Vision. For more information, please contact the app/service provider. In addition, after the Sony TV receives the software update, devices with Dolby Vision playback (such streaming media players and UHD Blu-ray players) that are connected to the Sony TV by HDMI will also require a software update to support Dolby Vision playback through the device. For more information on the timing of an update to a particular player, please contact the player’s manufacturer. You can search content while viewing the screen. Press the [↑] on the remote control to show all the search results. Then scroll through the categories using the directional buttons. Performance improvement: slow volume bar, etc. If the version number is "PKG6.5629.xxxx" or higher, you already have the most recent software version and updating is not required. Verify that the size of the "sony_dtvota_2016_1605629100_paa_auth.zip" file is "1 859 505 624" bytes. 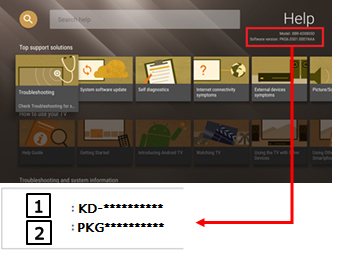 After you extracted the downloaded file, you will find the file "sony_dtv0FA60A0AA0AA_00004200_16056291000177.pkg". Copy or drag and drop the file "sony_dtv0FA60A0AA0AA_00004200_16056291000177.pkg" to the root directory of your USB device. Insert your USB storage device containing the file "sony_dtv0FA60A0AA0AA_00004200_16056291000177.pkg" into a USB port of the TV set. If the version number is "PKG6.5629.xxxx" or higher, the software update was successful. If the version number isn't "PKG6.5629.xxxx" or higher, download and install the update again.